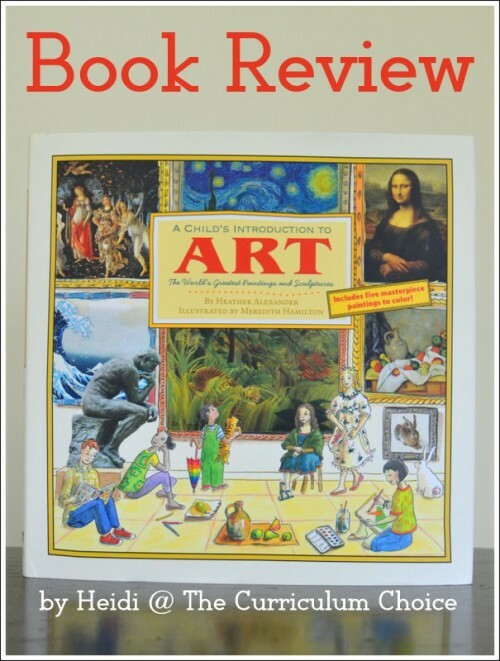 Within the nearly 100 full-color pages of A Child’s Introduction to Art you’ll find a trip to an art museum, a fine art appreciation class, a review of art history, and a lesson in art techniques all rolled into one! Disclosure: In January I raved about The Story of the Orchestra, so when Black Dog and Leventhal Publishers gave me the opportunity to review another children’s book I gladly accepted. They sent me this book free for review, and I’m here to share my honest opinion. A Child’s Introduction to Art begins with the early history of art (cave paintings to Medieval art), then proceeds to introduce 35 famous artists in chronological order. 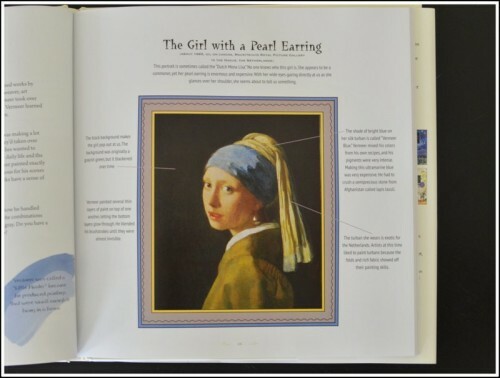 For each artist there is a 2-page spread with background information on the artist’s life and influences and a full-color picture of a famous piece by the artist. It’s like a timeline for art, showing the big picture and how art has changed through thousands of years. The author discusses how the artists were influenced by the art and artists that came before them, and includes historical events that had an impact on art. Within the discussions of the artists the author talks about styles of art (like illuminated books), including all the “isms” (like Impressionism). Along the way helpful vocabulary is introduced in context: art terms, tools, materials and techniques. 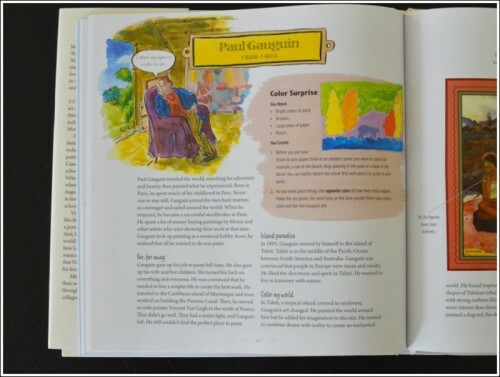 With the full-color image of the artwork, the author shares details in an introductory paragraph and through notations pointing out features. There is a wealth of information that makes this book a tremendous picture study resource: information about historical background or the event being captured, why the artist used certain colors or techniques or subjects, any symbolism present, etc. You are encouraged to look closely and think deeply. Another fun aspect of the book are the frequent projects to encourage your children to create art! There are ideas on techniques, subjects, styles and methods. Fore example: paint upside down like Michelangelo, draw a silhouette, arrange a still-life, try blockprinting, focus on facial expressions, make an advertising poster…the list goes on. 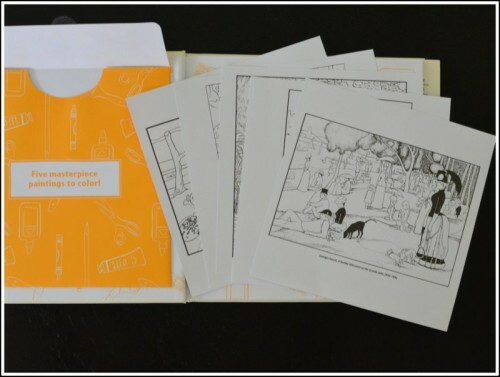 And last but not least, tucked into an envelope in the front cover of the book are line drawings of five famous masterpieces for your child to color! A Child’s Introduction to Art is one of those terrific multi-age resources that I can see using for years to come!